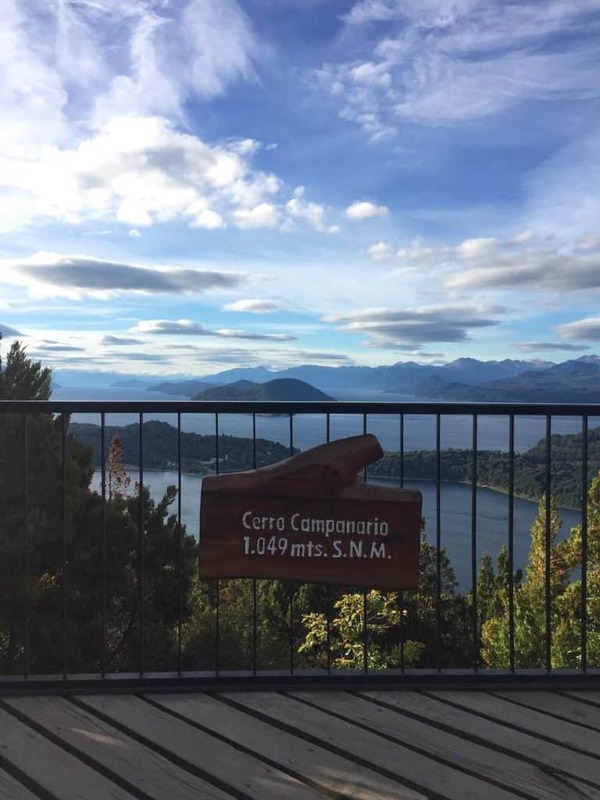 Cerro Campanario is one of Bariloche’s most celebrated and popular viewpoints, and for good reason. From the top you’re treated to uninterrupted 360 degree cinematic views over what seems like the entire lake district. Vast bodies of glistening water are punctuated by scatterings of tiny islands. The lakes act like monumental mirrors, brilliantly reflecting the snow capped mountains that tower above them. No matter which direction you look in the scenery is overwhelming in its magnitude. You can make out numerous landmarks including many of the famous mountains and lakes, Hotel Llao Llao and Bariloche itself. Here’s everything you need to know about Cerro Campanario. 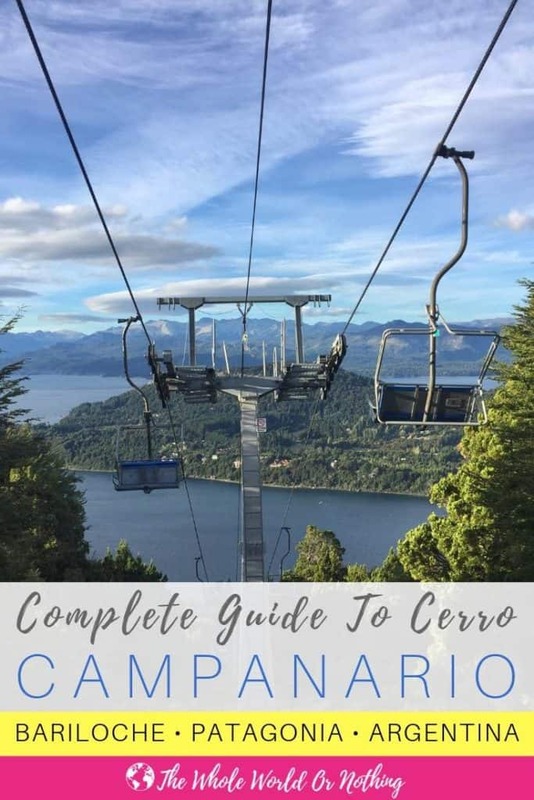 There are a few ways of getting to Cerro Campanario from Bariloche. Which one you choose will depend on your budget, how you like to travel and the level of comfort you want. Cerro Campanario can also be the used as a first or last stop on the Circuito Chico as it’s just before km18 where it starts. For more details on the unmissable Circuito Chico check out this full guide. 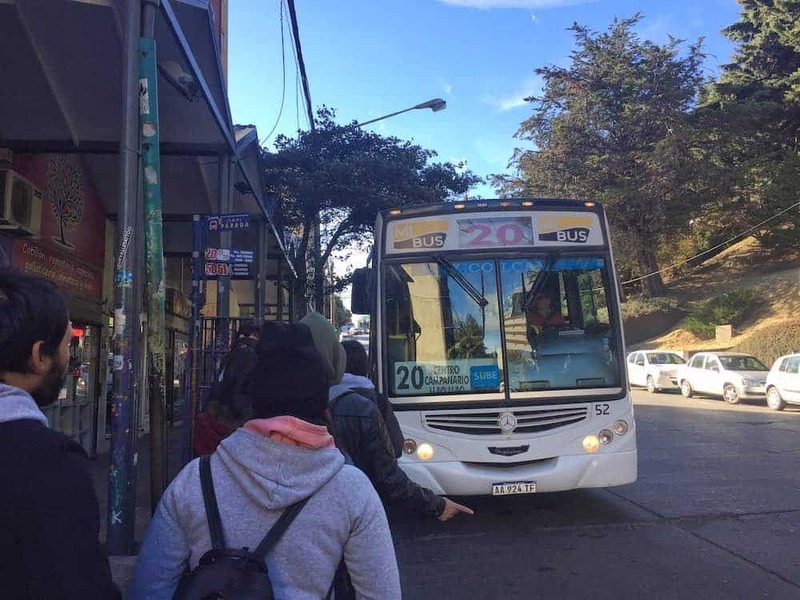 In Bariloche it’s not possible to pay for bus tickets in cash. The buses work on a prepaid system using SUBE cards that you scan as you jump on. Many other cities in Argentina, including Buenos Aires, use exactly the same system. If you’ve already picked a SUBE card up somewhere else then you can use that. If you don’t already have a SUBE card there are a few places in Bariloche where you can buy one. Plenty of the small convenience shops sell them and allow you to load cash onto them. Look out for the blue SUBE logo in window fronts or search this interactive map for locations of all local card sellers. There are two buses you can catch, the number 20 or the number 10. Their routes both start at Terminal and go through the centre of town. The main bus stop in the centre of Bariloche is opposite the Nahuel Huapi National Park office. Ask to go to the stop for Cerro Campanario – your card will be charged $39ARS (£0.70GBP, $0.90USD). 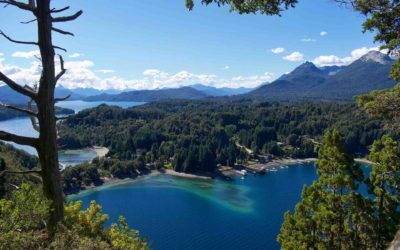 It’s around a 40 minute journey along a scenic route on the edge of Lake Nahuel Huapi. For the best views, get yourself a window seat on the right hand side. The bus driver will shout when you arrive and it’s where most people will be heading. So when you start to see an exodus for the exits you’re more than likely there. 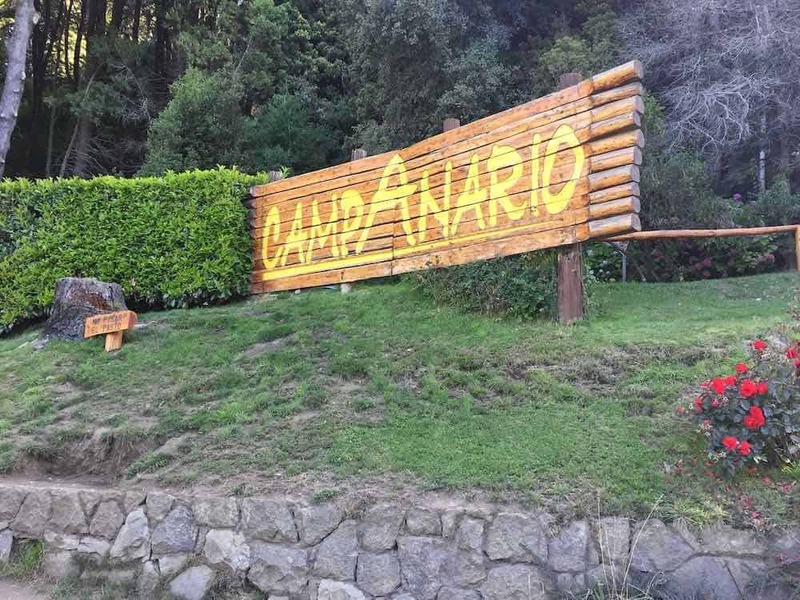 You’ll see the big wooden “Cerro Campanario” sign on the opposite side of the road. One thing to be aware of is that the buses do get extremely busy at peak times. Give yourself a bit of leeway on times as the buses will just drive past if they’re too full to pick anyone up. Alternatively you can walk about ten minutes up the road in the direction of Terminal to the next bus stop. The first number 20 bus leaves the centre at 4.10. After 5.55 they’re extremely regular departing every 20 minutes. The number 10 is not as regular with departures a couple of hours apart. For full timetables check out the operator Mi Bus’s website here. Remises are common across much of Argentina and are essentially taxis with a pre-agreed fair. This means no worrying about whether the driver is going to rip you off or uncertainty about how much your journey will cost. There are lots of Remise companies in Bariloche with advertised fares to all of the most popular spots. A remise from Bariloche to Cerro Campanario should cost in the region of $430ARS (£7.80GBP, $10.20USD) one way. 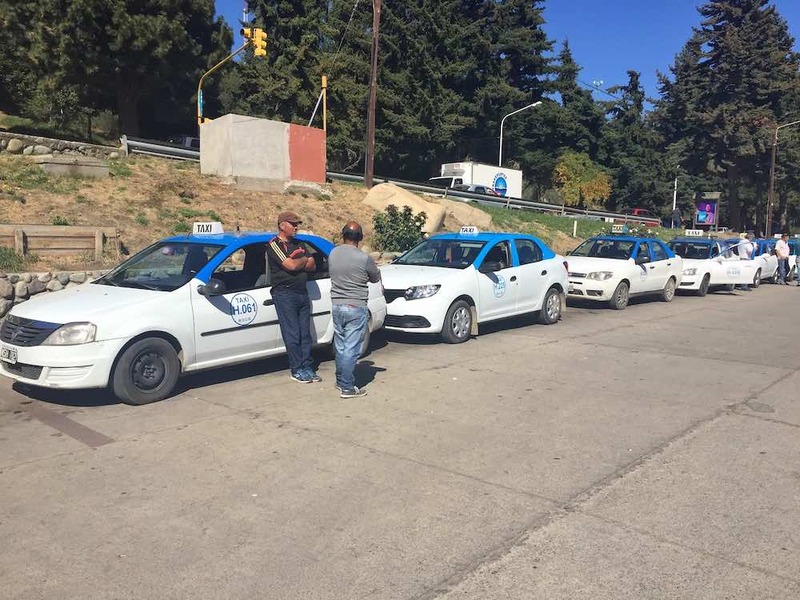 Bariloche’s distinctive blue and white taxis are plentiful, but are likely to be a little more expensive. There are tours that include a trip up to Cerro Campanario on the chairlift if that’s how you prefer to do things. This one encompasses a tour of the Circuito Chico as well which is also a great day out. 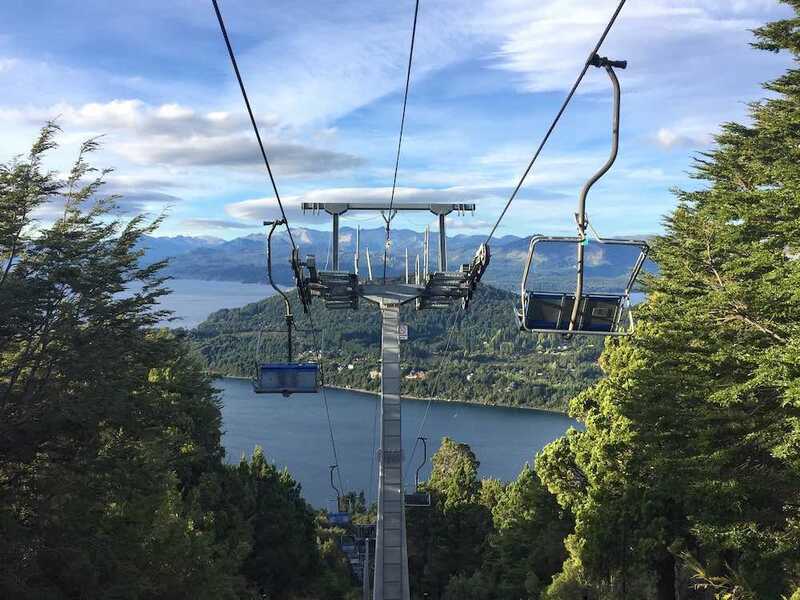 The chairlift to the top of Cerro Campanario is an exciting ride with awesome views. It’s a fantastic way to take in the surrounding scenery with the added thrill of being in an open chairlift. If you’re not into walking, would struggle to complete the hike, or just fancy a thrill, it’s a brilliant option. The chairlift runs over a channel cut through the trees on the mountainside and takes 7 minutes start to finish. 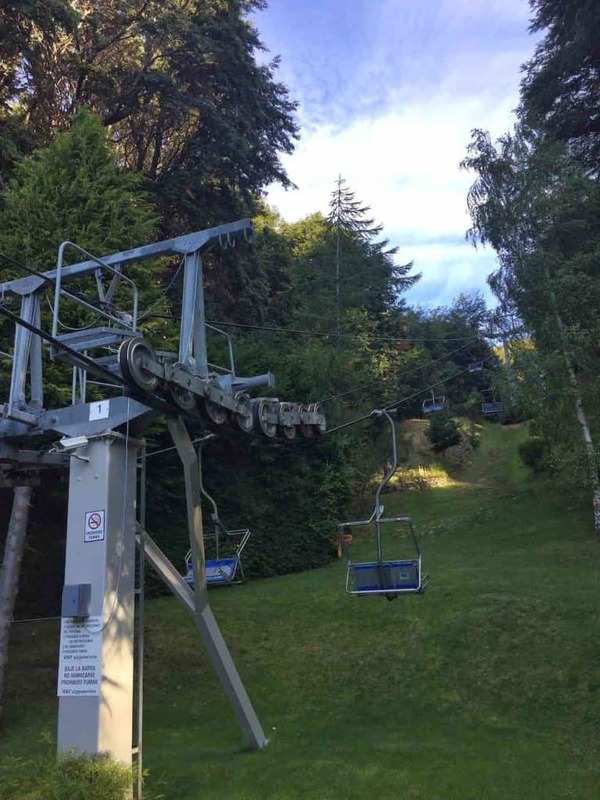 The chairlift costs $330ARS (£6.00GBP, $7.80USD) for adults. Kids under 5 go free, while children between 5 and 12 pay $165ARS (£3GBP, $3.90USD). The hike to the top of Cerro Campanario is a straightforward, if a little steep, well marked route. It takes around 30 minutes to get to viewing platforms by foot but the effort is well worth it. 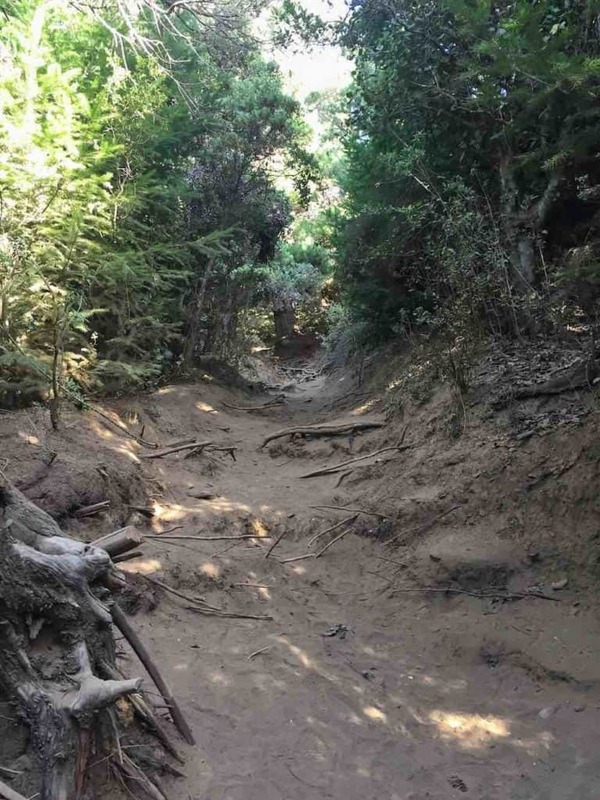 The terrain is a dirt path which can get a little slippy and is quite dusty. But there are absolutely no technical aspects to the hike and it’s an enjoyable jaunt up that anyone can do. 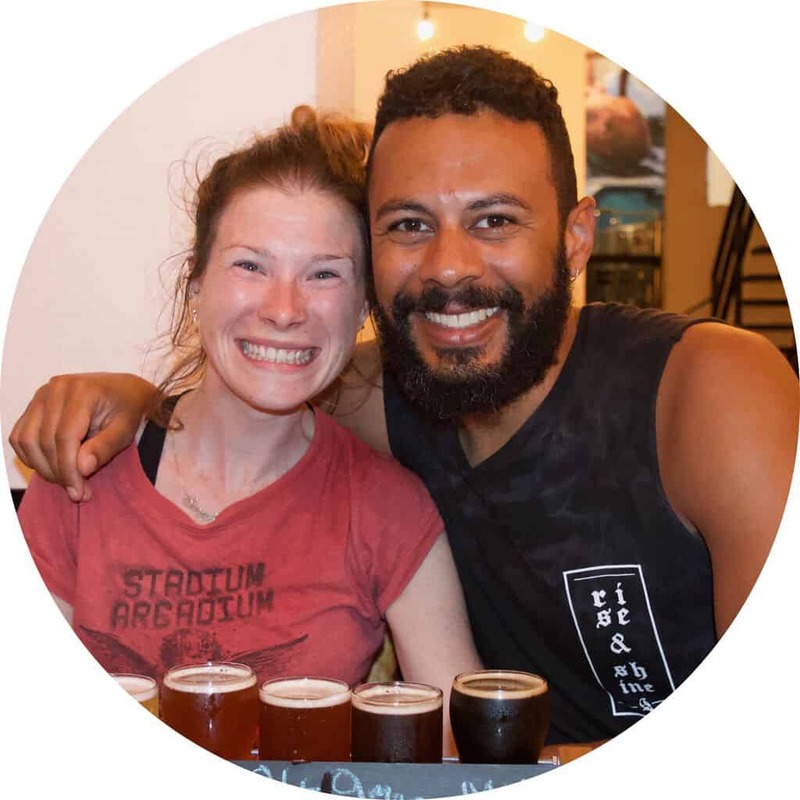 You don’t need to be super fit or an experienced hiker and people of all ages can complete it. 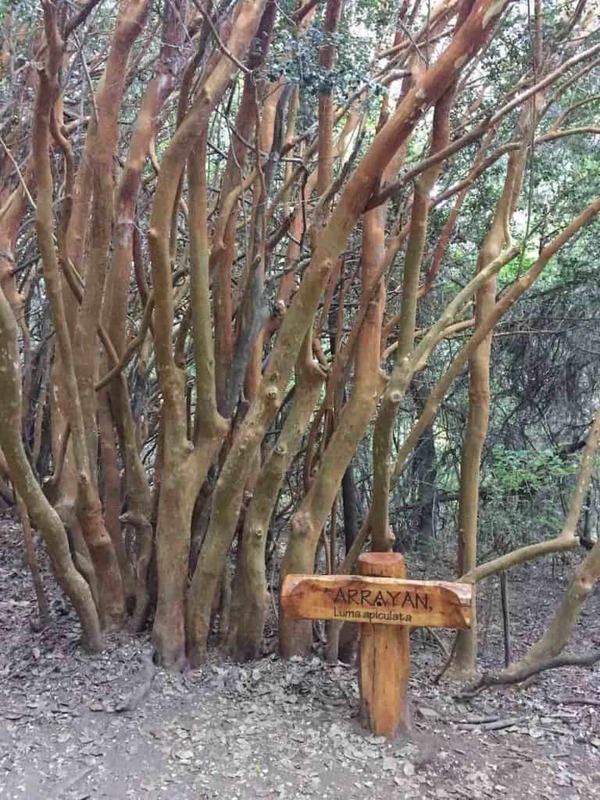 Along the way you’ll see a few of the famous red trees viewable in Los Arrayanes National Park plus other greenery and wildlife. But you can’t appreciate the views until you reach the top as the tree cover doesn’t allow for it. 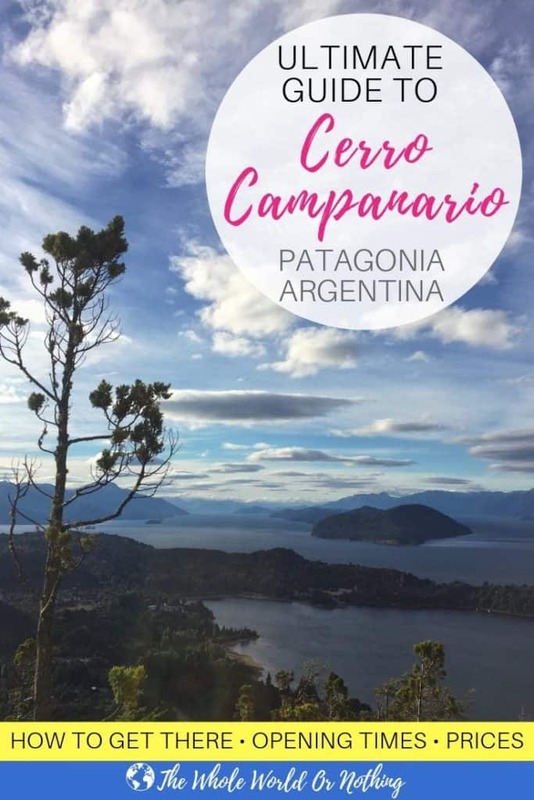 At the top of Cerro Campanario you’ll find an indoor cafe with panoramic views from its windows. It sells cakes and pastries, ice creams and lunch items as well as soft drinks, hot beverages and alcohol. There’s an outdoor bar sells beers and there are a few different outdoor seating areas to choose from. Prices are slightly higher than normal but nothing outrageous, particularly considering the setting. There are toilets at the top as well. Cerro Campanario is open at all times every day. However, the chairlift only runs between 9:00 and 18:00 with the last ride up leaving at 17:30. The shops and facilities at the top also shut at 18:00. This means that you can make your way up by foot whenever you like. Or alternatively you can catch the chairlift up and stay beyond 18:00 if you plan to walk back down. There are no crowds after hours so if you’d prefer a peaceful experience this may be a good time. During the day it gets pretty busy at times and there can be a lack of seating and space. It’s a special place to go for sunset as the receding light covers the landscape in a soft golden glow. You can take a bottle of wine and some snacks up to enjoy it with. Remember to take a torch or save some battery on your phone so you can get down in the dark. Cerro Campanario has an elevation of 1,049 metres meaning regardless of the weather it can get chilly on top. It can also be windy up there which can make it feel even colder, even if the sun is shining. For this reason it’s best to dress in layers and err on the side of caution, even in the summer. Take a warm jacket and a windbreaker and wear stuff that you can take off and add on as appropriate. 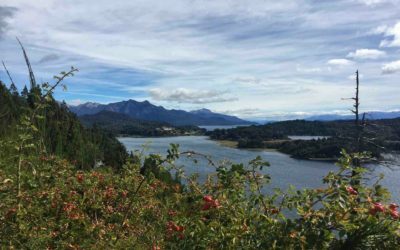 Bariloche is an adventurer’s paradise and while this is one of the least taxing hikes, insurance is still a must whenever you travel. 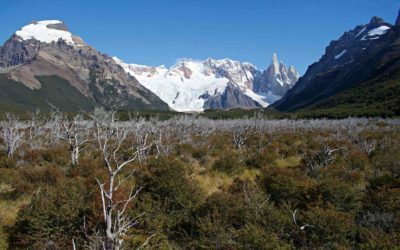 There are so many incredible things to do in Bariloche Argentina that it can be hard to narrow it down. Here are our top picks of what not to miss. 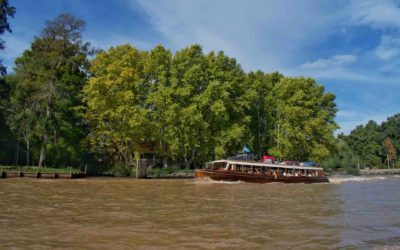 The charming watery world of Tigre, Buenos Aires, is just begging to be explored. Here’s how to get there, the best things to do and places to stay. 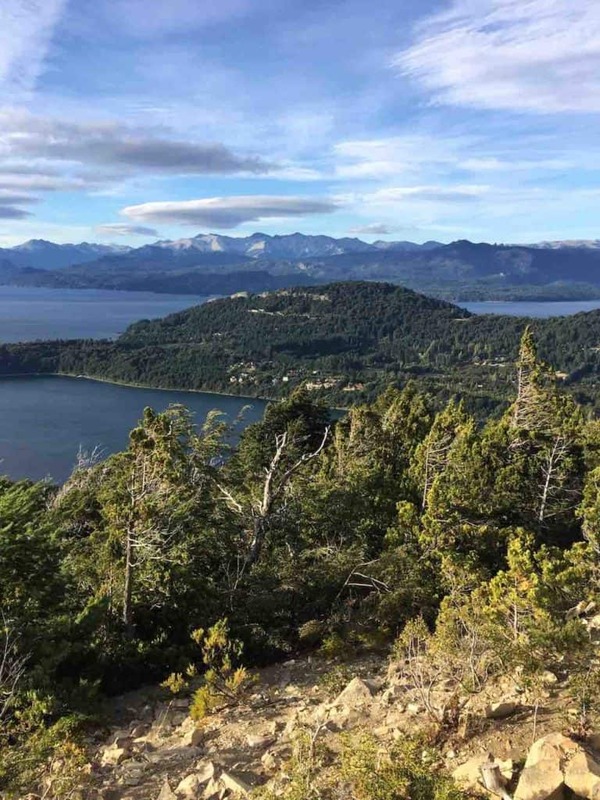 Cycling the Circuito Chico Bariloche is an incredible way to explore the stunning scenery of Patagonia’s lake district and this guide has all the details. 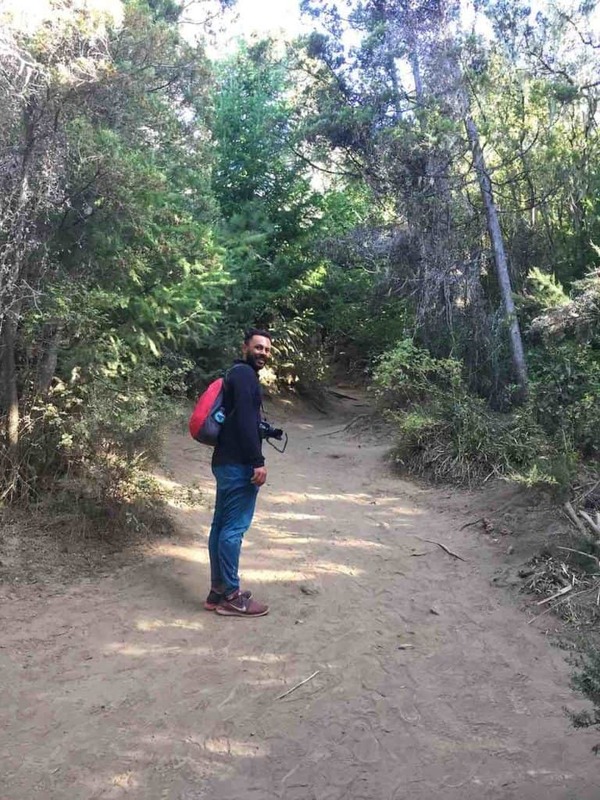 Check out all the details of how to get from Bariloche to El Chalten by road and by air, top tips for surviving the journey, and where to stay.